Are you looking for enrichment programs for your School, Daycare or Camp? 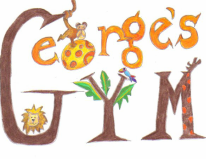 George's Gym's Tumbling Classes, Fun Fitness & Play-dates With a Twist are the perfect solution for your during or after school activities! As with all of our programs, we bring all of our own equipment and staff. We can work in any space, with groups of any size, age range and level! Our Fun Fitness Program is designed specifically for Schools and Daycares with a large number of children. We use our "learning through play" method to give kids a strong, high energy workout that they can repeat at home or anywhere! All Schools, Daycares and Camps must pay for their classes in advance month by month OR week by week. A $25 late fee will be applied for any payments received after the day of your scheduled class. If you choose to pay in advance, payment is due at the beginning of each month and the cost is based off of the average amount of children in attendance. You will receive a credit for any time your class is below the average amount in any given month and will owe the difference if it exceeds the average amount at the start of the next month. Cancellation Policy ~ In the event of an unscheduled cancellation, there is a $40 charge if it is less than 48 hours before your scheduled class.